Fast Fracture Reliability Analysis of Brittle Materials. NASA supported program which analyzes components made from Ceramics, Graphite, CERMETS, etc. Methodology of Fast Fracture Reliability analysis used in design of components made from brittle materials. 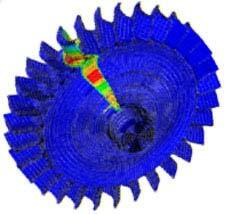 Stresses in a ceramic Turbine Wheel.